October 24, 2011--The U.S. Endurance Team collected a historic number of medals at the 2011 Pan American Endurance Championships in Santo Domingo, Chile. Taking the Team Silver medal in a combined time of 19:05:19 was John Crandall III with Heraldic, Valerie Kanavy and Spectacular Gold and Deborah Reich and Pandor. Meg Sleeper and Syrocco Cadence were eliminated at the mandatory recheck at vet gate three. The team finished just one minute and 47 seconds behind the Gold medal team from Uruguay. The home team of Chile took the Team Bronze. John Crandell and Heraldic at the Games in Chile. The U.S. Endurance Team won Team Silver at the Pan American Games Endurance Championship in Santo Domingo, Chile Oct. 22, with John Crandell and Heraldic also claiming Individual Silver while teammate Valerie Kanavy and Spectacular Gold nabbed Bronze. The three U.S. medals represent a historic high for the country’s showing in an international endurance competition. But it was Uruguay that dominated the top of the podium, taking Team Gold and Individual Gold in the senior division, while the host country of Chile commandeered the Young Rider classes. Uruguay’s team won on a combined time of 19:03:34. The U.S. trailed by a mere one minute and forty-seven seconds (on a combined time of 19:05:19), which Crandell summed up as “like winning by a nose as team scores go.” The Chilean home team took Bronze in a time of 21:42:29 in the 75-mile, CEI 3* event. Riding on the Silver U.S. team with Crandell and Kanavy was Deborah Reich and Pandor. Meg Sleeper and Syrocco Cadence were eliminated at the mandatory veterinary recheck at gate three. The veteran pair of Crandall and Heraldic completed the 120km course in 6:03:38 for their Silver medal. Their performance was all the more amazing in that they suffered a minor fall about a mile from the finish line. Bernardo Algorta, “an Uruguayan rider on a local Chilean horse gave me a good race in last leg, which was sealed when Heraldic had a fall in the last couple of kilometers. Heraldic jumped back up in good health and ran in just a few minutes behind the Uruguayan,” Crandell said. Individual Gold winner, Uruguay's Bernard Algorta. Kanavy and Spectacular Gold had a time of 6:05:47 for the Bronze. Algorta and Cacique won the Individual Gold in 5:59:27 and registered an impressive average speed of 20 km per hour. Crandell timed in with an average speed of 19.8 km, and Kanavy 19.7 km. Uruguayan riders Sofia Castells on Canto Molles and Paula Fort on Campanina came in fourth and fifth, respectively, with times of 6:19 and 6:21. Reich and Pandor finished in 6:55 to place tenth. Riding as an individual Cheryl Van Deusen and Moro Amado finished fifteenth. Crandell and the 13-year-old Arabian gelding Heraldic have an illustrious history together, having won in 2006 endurance racing’s “triple crown”: the Old Dominion 100, the Tevis Cup and the AERC Championship. 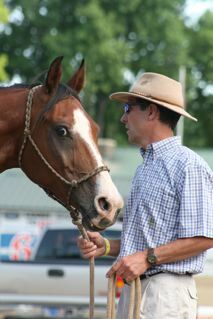 The horse was sidelined by a paddock injury in 2008, and came back to win the Tevis for Crandell in 2010. 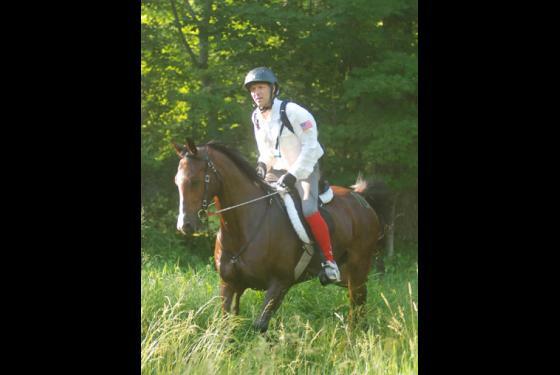 John Crandell and Heraldic picked up Team and Individual Silver at the Pan Am Games. 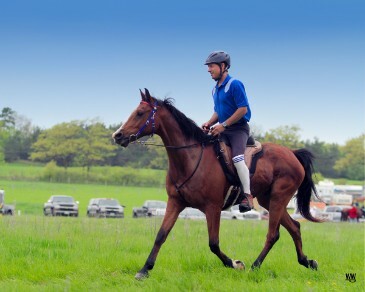 The history of Endurance in Chile dates back to a visit by a group of enthusiasts to the FEI World Championships at Fort Riley in Kansas, USA in 1996. On returning home they introduced the discipline to their native country, and began to organize races over distances of between 40 and 80 kilometres. Chilean competitors who rose to prominence during the early years included Marcial Taverne, Antonio Llompart, Alejandro Donoso, Marcelo Cortes and Ignacio Urenda. With its wide variety of weather and topography stretching from the Pacific Ocean to the imposing Andes mountains Chile provides some extraordinary endurance terrain. Every month, more than 200 riders assemble at a new local venue not only to compete, but also to appreciate the beauty of the natural world that surrounds them, and to share that experience with their horses. 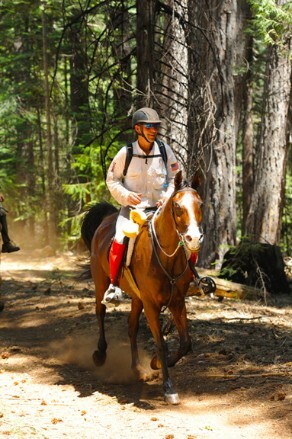 The 2011 Pan-American Endurance Championships, organized by the Chilean Association of Equestrian Endurance, took place at the 9,000 hectare resort of Brisas de Santo Domingo, located in the center of the country and on the shores of the Pacific. The circuit crossed both flat terrain and some mountainous areas, beginning by the sea and then climbing to a plateau filled with lakes and a great variety of flora and fauna including black-necked swans, foxes and hares and exotic trees like the Quillay and Peumo. The course, covering a distance of 120kms (or about 75 miles) was divided into five loops – the first 30kms long, the second 25km, the third 30km, the fourth 20km and then a fifth and final loop of 15km, and it demanded great skill on the part of the riders in their efforts to ensure their horses finished in good shape. They showed exactly that when there was a 63% completion rate in the Senior competition and 58% in the Young Rider section in which, however, the team from Chile were the only finishers when taking gold. Sebastian Taverne (Eclipse), Benjamin Boetsch (Khadijah) and Pablo Llompart (Ankar Samuray) recorded a combined riding time of 7:09:38, and Taverne’s average speed of 19.73 km confirmed him as Individual Young Rider Champion ahead of Colombia’s Cristina Mutis (Tiawa) whose average speed was 19.41 km. Boetsch (Khadijah) took Individual bronze with an average speed of 18.87 km, and a total of 14 horse-and-rider partnerships from five nations – Chile, Colombia, Argentina, Ecuador and Uruguay – competed. Uruguay’s Bernardo Algorta enjoyed an even bigger celebration when his horse, Cacique, was presented with the Best Condition Award – no mean feat having completed his race with a sensational riding time of just 5 hours, 59 minutes and 27 seconds. Senior Teams: GOLD – Uruguay 7:03:32: Canuto Molles (Sofia Castells), Campanina (Paula Fort), Nagfour (Jorge Martinez); SILVER – USA 7:05:19 – Heraldic (John Crandell), Spectacular Gold (Valerie Kanavy), Pandor (Debora Reich) ; BRONZE – Chile 9:42:49 – Konsterrus (Lukas Buckel), Al Hatal El Shamaat (Alejandro Kiss), Pistrat (Ana Maria Novoa) . Senior Individuals: GOLD – Cacique (Bernardo Algorta) Uruguay 20 kmh; SILVER – Heraldic (John Crandell) USA 19.8 kmh; BRONZE – Spectacular Road (Valerie Kanavy) 19.7 kmh. Young Rider Teams: GOLD – Chile 7:09:38 – Eclipse (Sebastian Taverne), Khadijah (Benjamin Boetsch), Ankar Samuray (Pablo Llompart). Thank you the many supports that help this team get there. Heraldic has found another great deal for you! 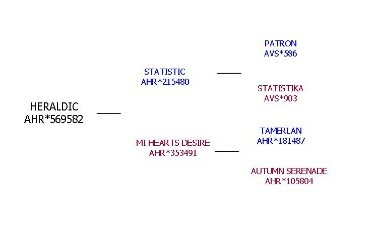 The Distance Depot will offer $10.00 off purchases $100.00 or more on ON-LINE orders by December 31st, 2011 if you use COUPON CODE: HERALDIC. What a great way to start off your Christmas shopping! Pictured here is the USA TEAM tack that will be heading to the Pan Am Games in Chile! Thank You Distance Depot for supplying the TEAM USA tack for Chile. Heraldic & John also Thank You for your generous support. Long Run Arabians sure does! John will be interviewed on www.horsesinthemorning.com, they are the only live morning show for the horse world with thousands of listeners around the world on Thursday morning about 9:30 am Eastern! Feel free to listen in! Heraldic, John and Long Run Arabians would like to Thank Tom and Halldis for their generous support in helping Heraldic get to Chile! 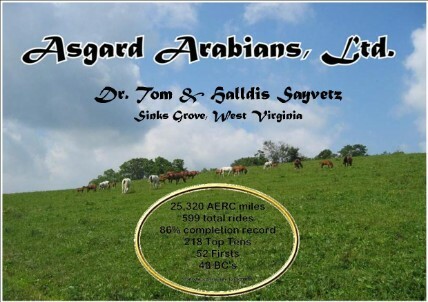 Please visit Asgard Arabians and have a look at their great inventory of outstanding horses. Farrier: John Crandell III - Racing with Kercheart Triumph Aluminium shoes. It is official - Heraldic is heading to Chile! The plan is for the horses to ship out of Miami on Oct 7th, not far away! Heraldic now has a facebook (http://www.facebook.com/#!/pages/Heraldic/246652352042241) page and will be posting his training sessions along with important info about his trip and once he arrives, he will keep you updated on the day to day routine. The GOAL in Chile is to bring the GOLD home for Team USA! Using KER supplements? Or not? John Crandell III and HERALDIC have an invitation for you. John and Heraldic are part of KER’s “Champion Program” and they have been given a code for you to use when purchasing KER products. So, if you are already using KER or KERx products, here is a great savings for you and if you are not and want to try their amazing products, you too will benefit! This code will allow you a 10% discount off the published retail price of KER and KERx branded supplements purchased directly from KER (phone, fax, e-mail or online catalog). Even more discount available ~ clients may opt for automatic reordering of supplements (via credit card on file) in order to receive an additional 5% off the published retail price for a total discount of 15%. That is a Champion deal! RiteTrac™ ~ Supports Total Digestive Tract Health - RiteTrac has EquiShure in it but also has two stomach buffers, so it helps the stomach and the hindgut. This is a great supplement for traveling. HEMABUILD is a concentrated blend of chelated iron, copper, zinc, cobalt and B vitamins. Horses under the stresses of hard work, racing, competition and travel may suffer from suppression of red blood cell production, together with reduced life span of red cells or increased losses due to bleeding. HEMABUILD is formulated for use in horses under the rigors of training and racing, or competition. It is recommended for use in the nutritional support of red blood cell production.